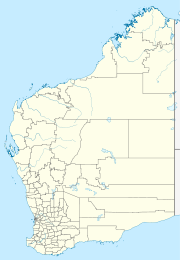 Kunawarritji (also referred to as Well 33) is an Aboriginal community, located in the Pilbara region of Western Australia, within the Shire of East Pilbara on the Canning Stock Route. Fuel (diesel and Opal) and a limited range of supplies are available from the store. The community is covered by the Determined Martu native title claim area (WC 96/78). A prescribed body corporate named the Western Desert Lands Aboriginal Corporation was registered for the Martu land on 17 July 2003. Future development at the community requires the authorisation of the prescribed body corporate. The community is managed by its incorporated body, the Kiwirrkurra Council Aboriginal Corporation, incorporated under the Aboriginal Councils and Associations Act 1976 on 8 October 1984. Kunawarritji layout plan No.1 was endorsed by the community and WAPC in 2004. ^ Hema, Maps (2005). Australia’s Great Desert Tracks NW Sheet (Map). Eight Mile Plains Queensland: Hema Maps. ISBN 978-1-86500-159-3. This page was last edited on 11 June 2017, at 12:18 (UTC).